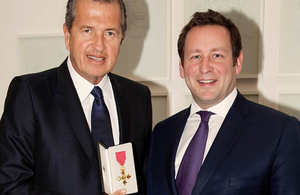 Peruvian-born photographer Mario Testino HonFRPS was presented with an honorary OBE (Officer of the Most Excellent Order of the British Empire) on 14 January 2014 by Culture Minister Ed Vaizey in recognition of his service to photography and charity. One of the most highly regarded fashion and portrait photographers in the world, Mario Testino came to London in 1976 to train as a photographer. He made his name as a contributor to various fashion magazines and by the early 90s he emerged as one of the leading fashion and portrait photographers. Since then his work has featured worldwide in magazines such as Vogue and Vanity Fair. His work has also been exhibited in galleries and museums across the world. One of his most successful exhibitions was ‘Portraits’ at the National Portrait Gallery in 2002, which showcased over 100 works and received huge visitor numbers. As well as his work as a leading photographer, Mario Testino is also a great charity supporter. He launched a campaign with Save the Children to raise funds for victims of the 2007 earthquake which hit the coast of Peru, with the El Salvador clinic being entirely funded from the sale of a single print from his iconic Princess Diana portraits. He also supports Aid for AIDS, Life Ball and the Naked Heart Foundation among many others, and has received many awards for his photography and charitable work. In 2012 he opened his first not-for-profit association in Barranco, Lima called ‘MATE’ which will act as a platform for Peruvian art and will hold a permanent exhibition of his works.